This small inkstone box is decorated overall in traditional 'ichimatsu' (repeating squares) design and depicts six dragonflies in flight. Each dragonfly is created with a different lacquer technique. 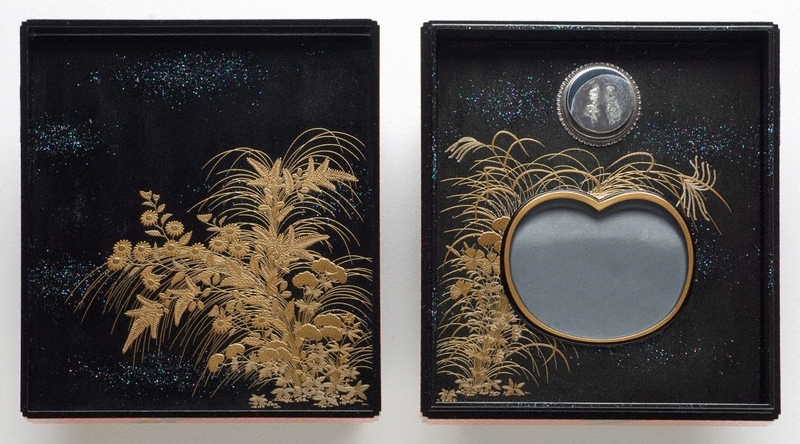 The interior of the box, autumn grasses, is executed in Kaga style 'takamakie' (Igarashi Doho) and a 'kawarinuri raden' technique on a black background. The inkstone in the form of the full autumn moon is in silver and gold. The inkstone is a traditional 'Amahata suhama suzuri' (a heart-shape representing the waterline ). The theme of the box is the contrast between summer and the coming winter suggested by the autumn foliage, one manifestation of the Japanese sentiment ‘mono no aware’. 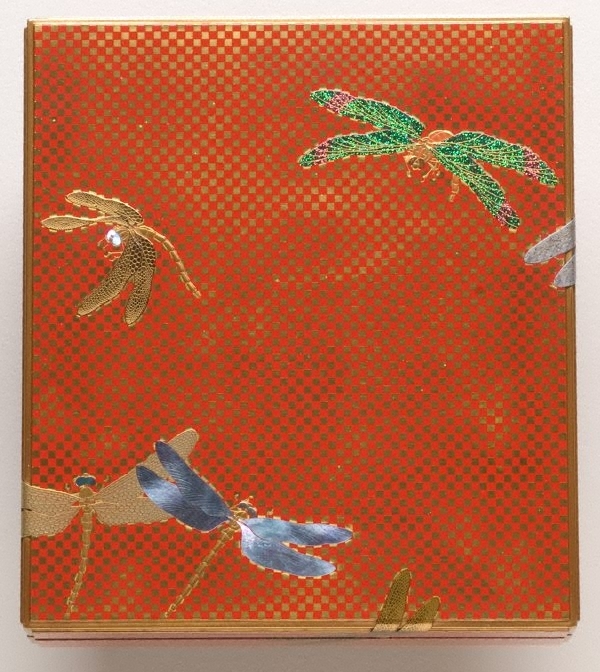 The lingering brilliance of summer is evoked by the bright energy of the red and gold 'ichimatsu' design and the dazzling beauty of the dragonflies. Reaching the peak of their strength in summer, their colours are a result of reflecting and refracting the power of light, admirably expressed by the artist with the use of gold 'kirikane' and 'shu urushi' (red lacquer). The inside of the lid and the main body of the box suggests an evening landscape, the soft light washing across the surface of the autumn foliage. The unique technique of 'raden', used as 'nashiji' in the background of the foliage, represents stars in a night sky. The dragonfly, 'tonbo' in Japanese, can also be read as 'katsumushi', 'katsu' meaning ‘victory’ and has thus long been associated with the samurai classes as a symbol of victory and courage. Its resplendent colours in refracted light can also symbolize the idea of surface illusion. 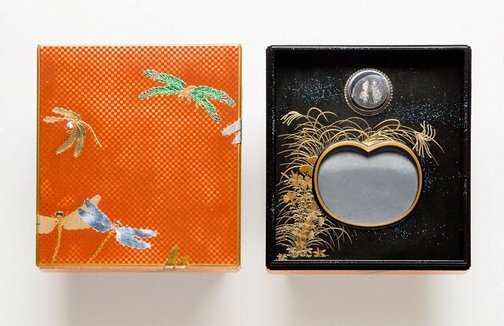 Working in the tradition of the Koami family, who served the Tokugawa Shogunate in the Edo period, Unryūan’s works preserve on the one hand sophisticated traditional lacquer techniques but are on the other hand imbued with a contemporary sense of aesthetics. He is considered one of Japan’s leading contemporary lacquer artists. Asian Art Department, AGNSW, October 2008. Jill Sykes, Look , 'Ancient art with a new twist', pg. 54, Sydney, May 2009, 54 (colour illus.). Art Gallery of New South Wales annual report 2008–09 , Sydney, 2009, 13 (colour illus. ).